Often when returning to work after a holiday, our brains are focussed on priorities like waking up on time or getting a head start on our New Year’s resolutions. Safety isn’t always front of mind and that’s why we often see a higher rate of injuries and incidents at this time of year. The rush to finish out the year might mean that your worksite or office could be a bit messy and there could be a lot of tripping hazards lying about when you return. Or, having a break from your normal routines at work means that you might skip some steps in normal process or don’t ask for help when it might be a two person job. Take the time to re-acquaint yourself with your work site or office. Check to see if there have been any changes while you were away. Many incidents that occur are a result of small changes to tools, equipment or environments. Chat to your manager or supervisor about those changes if they affect the way that you do your job (i.e. could they become a hazard? Or do they limit your ability to do your work efficiently?). Mentally go through all the steps you would normally take to complete each task. Think about whether there are any potential hazards that could occur, how they are controlled or if they aren’t, plan out how you can avoid those hazards and discuss them with your manager or supervisor. Do a thorough check of all tools and equipment that you will be using to make sure that everything is in working order. If it is safe and you know how, fix any issues, or report it to your manager/supervisor. It is also important to make sure that you have the required knowledge for the tools or equipment you use. Brush up by reviewing any training materials you have on hand or do a quick online search for any manufacturer’s manuals. We need to get our brains back in the game and the best way to do it is to actively focus on your task at hand. Rather than go through the motions, mindfully work through your task. Pay attention to each movement you make, where you are placing your body parts (especially hands and fingers) during the movement and practice awareness. While they may save you time, the consequences of taking shortcuts at work can be tragic and potentially life threatening for you or those around you. Processes, procedures, tools and equipment exist because they have all been identified as the best and safest way to perform a task. When you go off the book, you risk opening yourself up to danger. Bearing that in mind, some shortcuts can be made safe if you see a better, more efficient way of performing a task that is also equally safe, chat to your manager or supervisor before acting. Warming up loosens joints and increases blood flow to prepare the body to be active. It also improves circulation and promotes good posture, but most of all, it helps prevent us from being injured. It can also help you refocus your mind by thinking about the task ahead and working out how best you can move your body to prepare for that task. Spend some time doing some simple slow stretches, holding each stretch for a minimum of ten seconds. One incident can change yours and the lives of your family forever. At Programmed, all of our employees have our CEO’s support to STOP and REPORT any activity that presents an immediate risk to themselves or others. It doesn’t matter if you are under work pressures or demands, your safety is number one so you should stop any task that doesn’t feel safe. We all like to put on a brave face and think that we can muscle through when we are dealing with negative thoughts. But if something is affecting your work or your safety at work, people need to know and nine times out of ten they will be eager to help you out. If you don’t feel comfortable speaking up to your colleagues, most companies have Employee Assistance Programs (EAP) that offer free counselling. At Programmed, all of our employees have access to our EAP providers; we work with Converge in Australia and Vitae in New Zealand. What is your reason for staying safe? Everyone has the same right to return home from work in the same condition that they arrived for work in, uninjured. 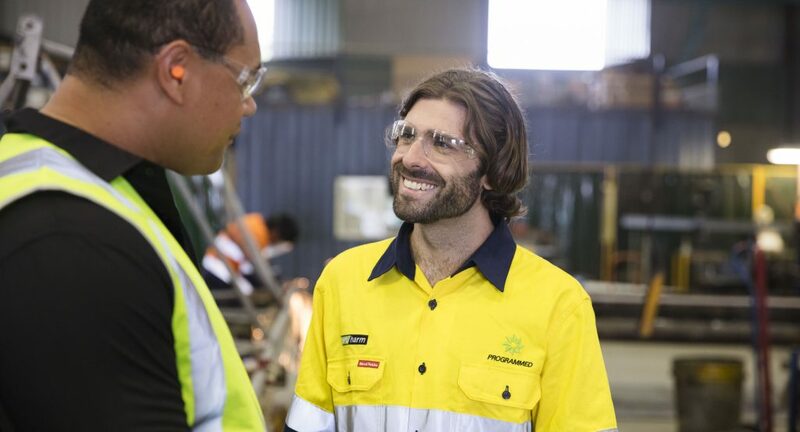 For us at Programmed, that is our ultimate goal and we continually work with our customers to make sure that they are providing a safe environment for our workers. But we all need to work as a team and you play a key role in your safety. So, think about your reason for staying safe: is it your family, friends, pet or even just being in good nick for your hobbies or sports activities? Then think about what you can do every day to make sure that you and your work mates stay safe at work. It’s a big help info. Thank you very much! Thank you for the reminder to always put safety of ourselves and others as the number one priority. Thank you for the information, safety is the first priority at work that everyone should be aware of, very good reminder. Thank you very much for reminding us that safety is our number one priority. Thank you very much for reminding us to always put safety as the number one priority that everyone must be so careful in the Work place all the time. Very helpful safety tips! Kudos to Programmed Skilled Workforce. Thanku for the reminder, its true u must always stay focus, n safe, & it is important to warm up every morning. Gets you through your day.